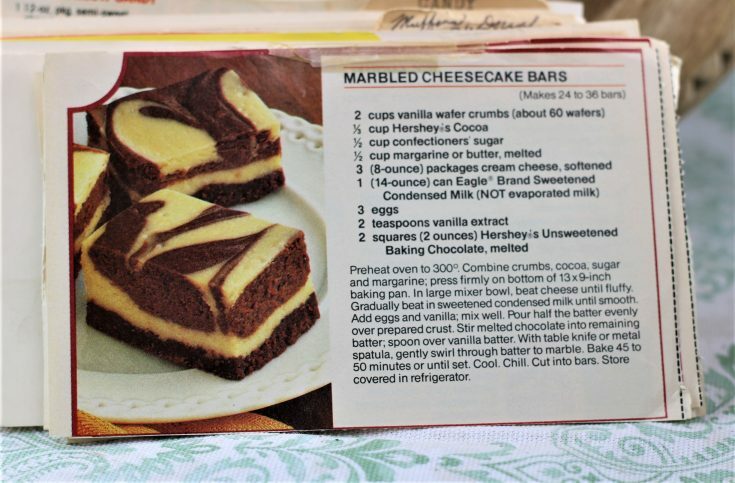 Front of the recipe card for Marbled Cheesecake Bars. 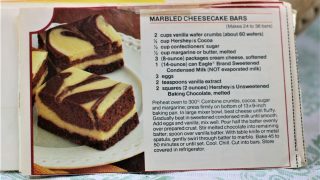 There are lots of fun recipes to read in the box this recipe for Marbled Cheesecake Bars was with. Use the links below to view other recipes similar to this Marbled Cheesecake Bars recipe. If you make this Marbled Cheesecake Bars recipe, please share your photos and comments below! Combine crumbs, cocoa, sugar and margarine; press firmly on bottom of 13x9-inch baking pan. Add eggs and vanila; mix well. Pour half the batter evenly over prepared crust. Stir melted chocolate into remaining batter; spoon over vanilla batter. With table knife or metal spatula, gently swirl through batter to marble.